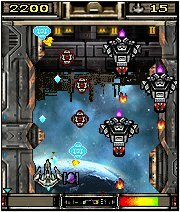 A version of the classic Galactic Alien Force (G.A.F) game for phones with 176×208 or 176×220 px screens. Also works on larger screens but doesn’t use the whole screen. It’s a Space Invaders clone with better graphics and more types of aliens and a cannon that moves up and down instead of just left and right. The games and apps on BoostApps were are not written for Android. Use the Google Play Store for Android apps. I don’t know. Does the itel2080 support Java ME? If it does the came is likely to work. will it work on cherry mobile C8i? I don’t think so. The Cherry Mobile site doesn’t say that the C8i supports Java ME. Will it work on nokia 208? How much does it spend to download thiss? The app is 137 KB so it will cost 137 times your operator’s price per KB plus about 20% for network overhead. How to download that ? ?